I have Georgia on my mind. Literally. I recently changed the typeface of my document program at work to Georgia to synchronize it with my e-mail and word processing program at home, so I am now immersed in the same familiar characters all day long. I find the text in this typeface appears friendly and charming, beckoning me into the white space around it. It’s to the point where if someone returns one of my documents in another typeface, I’ll convert it back into Georgia. Indeed, I’ve become very attached — which to me seems a bit crazy. I mean, it’s a font. Today, as different typefaces become more widely available, it’s easier to find one that suits your style and personality. There are tens of thousands of typefaces, with more being invented all the time. And thanks to a new software program called Typeface, anyone can have the ultimate personalized font. With Typeface, you sit in front of the computer webcam and its software designs a font based on the shape of your face and expression — bulbous nose, arched eyebrows and all. So it would appear that there is some larger desire to personalize the script we use to punch words onto screens every day. Perhaps we’re seeking more connection to the words we type. Or perhaps typeface is becoming the new handwriting. Let’s look at the facts. Handwriting, we can all agree, is in a downward spiral. I can count the number of times I pick up a pen on an average day on one hand. The emotional connection I have with my writing has been relegated to late night scribbling. Experts have long argued that handwriting is important to help us feel connected to the words we shape and to help develop our individuality. But if we’re writing less by hand, it seems the emotion will have to come more through the machines we use. Hello…Georgia! 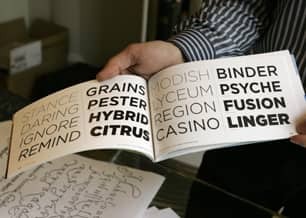 “More people are gravitating towards a favourite typeface,” says Keith Rushton, chair of graphic design at the Ontario College of Art and Design. Rushton himself has 10 favourite typefaces and he points out that many authors want their books set in a particular typeface, one they feel represents them. Some writers, such as Mordecai Richler, Chaucer, Lord Byron and Jonathan Swift, even have scripts named after them. The language that’s used to describe typefaces helps explain why some of us get emotionally attached. Georgia, for instance, is said to be “sturdy.” It “exudes a sense of friendliness; a feeling of intimacy” and is from a family with “character and charm” whose typeface ancestors are Scotch Roman. Given this description, Georgia is practically ready to strut across the screen and down a few pints. Rushton says it’s not unusual for typographers to say things about a favourite font like “that’s an incredibly sensual typeface,” or that the typeface has nice thick and thins, beautiful curves or nice rhythm, crescendo or composition. In this sense, typeface imbues us with the warmth and familiarity of a favourite song, or our own script. Perhaps the evolution from personal handwriting to typeface is just part of the natural progression of language. For his part, Rushton says typefaces are a language unto themselves and have developed along with the written word. Letter forms have progressed as our language has moved from walls to tablets, then to leather and paper, and now to screens. The 18th century printer John Baskerville graduated from stone to paper, parlaying his talent engraving gravestones into the popular Baskerville typeface. But an ever-growing number of fonts are available to download to help us personalize our e-interactions, and so gradually make typeface a more viable replacement for handwriting. More than anything, I find it’s important to simply write for myself in a font I feel emotionally connected to. Maybe you’re just fine with using Helvetica or Times Roman for your computer-based writing. But I, for one, will continue to have Georgia on my mind.